Many of you may be reading that title and assuming that this is yet another comparison of taking Majora’s Mask elements and implementing them into the next Zelda title. Based on this site’s history, I wouldn’t blame you. However, this piece is actually based on a rumor. Essentially, it’s speculation about speculation. Yesterday we reported about some “significant” Zelda Wii rumors that may or may not be true. One of the more intriguing of those rumors was the idea that Link in the next game is The Hero of Time. What this could entail is a direct sequel to Ocarina of Time’s child timeline after Majora’s Mask. I will attempt to paint what I feel could happen in this mystical world. Keep in mind this piece is purely speculative, based on rumors, and is largely a fantasy. Let’s step back in time (literally) and try to imagine what Zelda Wii could be in this era. There are a lot of things in that rumor mill yesterday that can paint a decent picture for this new post Majora’s Mask world. In fact, one could dare say even the art, to this point, could further support the thought. First off, at the beginning of Majora’s Mask, Link sets off to find Navi. While on his travels (presumably in the lost woods) he is jumped by the Skull Kid, and then the events of Majora’s Mask happen. At the end of the game, the last we see of Link is him riding off on Epona in the forest. There is a lot of speculation around where he is, but I honestly feel we can safely assume he returned to where he was prior to being in Termina. That being the case, where does he go from there? Well, one can assume that he is back on his quest to find Navi and that would leave things pretty wide open. Some of the evidence to suggest this could indeed be the fairy/spirit/female that is featured in the art that Nintendo showed us at E3. I am not so sure it is that farfetched to think that the girl in the picture is indeed Navi, all grown up. In her full form she prefers to be called Adelle, as her past life is just that, a past life. Now, as the rumors suggest, this game would take place outside of Hyrule… at least party. This fits well into a post Majora’s Mask world, because we really have no idea where Link was heading or if he found Navi at all. A post Majora’s Mask world could, essentially, be anything. If Nintendo ever wanted a chance, just one shot, to try and create a new vast world that wasn’t Hyrule, this could certainly be it. The one thing I take issue with in the rumors themselves is the village he lives in and how there is a boy that looks up to him. If this is indeed the “Hero of Time”, then he doesn’t need a crash course in starting out as a nobody again. He already is a somebody, so having just a single boy look up to him makes it feel like either he is a nobody in this new land… or something along the way got fudged up. In either case, since Twilight Princess is often placed next on the child timeline, Zelda Wii would need to end in a way that would suggest the events in Twilight Princess. Minimally, it would have to end in a fashion that leads back to Hyrule itself. This new land obviously would not contain the Master Sword. That sword is still in the Temple of Time, located back in Hyrule. There would still be question as to how Ganondorf was stopped, but that could also be what this game is. Without Link letting Ganondorf into the sacred realm, he isn’t nearly as powerful as he use to be. 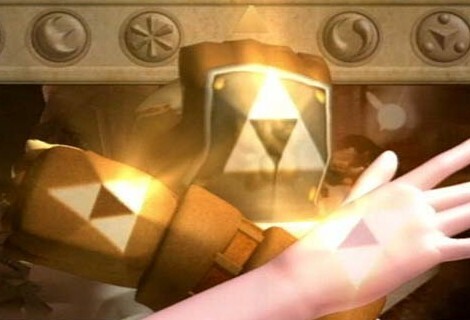 One thing that he still could do, however, is muster an army to invade Hyrule. If this game takes place 10 or so years after Majora’s Mask, we could be seeing Ganondorf’s army then invading this new land. That would set the plot up to essentially fight back the invasion via various dungeons, and then work your way back to Hyrule to save your homeland. This could markedly also mean that Zelda playing the role of Sheik could return, and then everything could get linked into time travel. This time around, Time Travel may refer more to the use of the Ocarina itself, just like in Majora’s Mask. So here is the big picture: Link travels off to a new world where he finds Navi. As they grow up together, she wishes to be called Adelle, and grows much fonder of her bigger form. While all this is going on and Link is simply living his life, Hyrule is invaded completely by Ganondorf. He then marches his army into the new world, which jolts Link’s memory that he was brought back to prevent exactly what had already happened… yet this time it happened without his help. This could set the story up for a tale of greatness, that would draw the entire Ocarina of Time crowd back to Zelda, while giving them a whole new world to play with. The chances of this being true? Slim to none. It’s just food for thought really. Even if it turns out true that Link is, once again, The Hero of Time… it could simply imply a direct follow up on the Adult Timeline, or possibly even The Hero of Time being reborn at a later date. In the end, no one really knows but Nintendo. It’s just fun to think of all the possibilities you can build off of these rumors. Let’s assume, even if for a moment, that the rumors are true. What then would you imagine this next game to be?